Christmas 2018 and The Twins Turn 75! Nearly 6000 words to describe a 261 mile RV trip?! Absolutely! 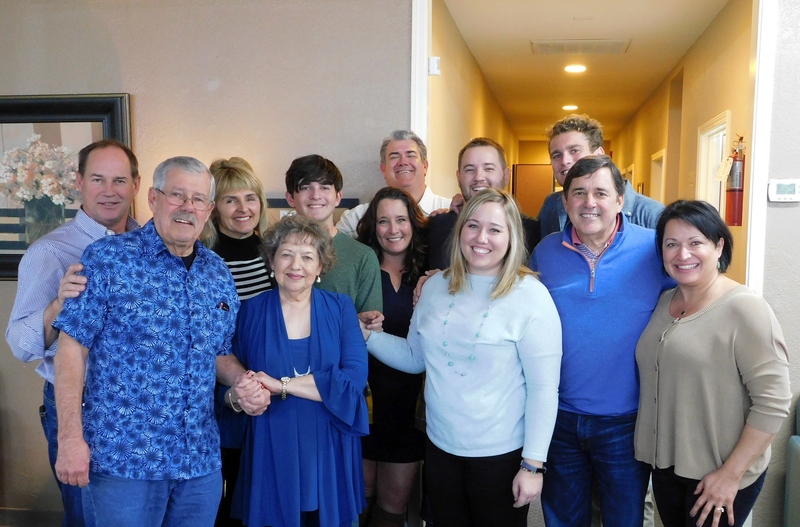 Our week long celebration of Christmas and The Twins 75th birthday turned out to be something very special – more special than any inkling I had as we planned the trip. Family made the week’s celebration so special. Folks came from many miles away to wish Gale and I a happy 75th birthday. The smiles on the faces in almost all the photos of our joint party are for real; the love in the place was palpable! It was a very, very warm and loving experience and I am so thankful for everyone’s participation. Then to have the same folks who already threw a big party just for me at Craig’s, drive over a hundred miles to participate in another party spoke volumes about the family I married in to! I was not only surprised when I discovered they all made the trip; I was also very deeply touched. We all are so very blessed to be part of a very loving family. So, yes! I wrote nearly 6000 word because it took that many to properly record what a lovely week we shared together – and like many of my stories on this site, I will return often to relive the wonderful times. And I hope you do, too! Yep, December 25th rolled around once again, and we would be rolling along in Big Blue, as usual, to Craig’s Castle in Stockton and later in the week to my dear sister, Gale and hubby John’s country home in Gridley, Kalifornistan! I was sooo looking forward to Christmas Day – and even for the travel – as I hadn’t been aboard the coach for over a month. My cute lil’ Trail Buddy helped load the coach for our grand Christmas and birthday tour to family in Stockton and Gridley. We had a big job to load the coach for up to a week, depending on how long we stayed at Craig’s Castle after my birthday party on the 26th. Allen and Nancy were to arrive at Craig’s on the 26th to visit the family and celebrate my birthday. Depending on what activities they and Craig would come up with, we might stay for as long as three days. Perhaps we’d head home for a day or two if they didn’t plan to stay near home. We were due at Gale’s perhaps Saturday, and certainly by Sunday for another birthday party that was planned for both Gale and I for what was billed as our 150th birthday! En route to Craig’s, I pulled into a Stockton Shell station that was selling diesel cheaper than anyone for miles around, at just $3.50 per. As I pumped on the fuel I realized that I was pumping with the slowest pump I’d ever encountered. It took us about a half hour to pump on 50 gallons, which was all I needed, and stopped. We would fill up at a casino in Oroville, near Gridley for 40¢ less per gallon! While the average price for diesel in Kalifornistan was about $3.93 at the time, the casino sold it for just $3.10! We arrived at Craig’s Castle overlooking the waters of the Delta a bit after 1300 hours, and after he guided me back into the somewhat tight parking spot on his driveway, I set up the coach for our Christmas gathering. Big Blue parked for the celebration at Craig’s Castle for Christmas 2018. We had lots of help carrying gifts and food from the coach up to the kitchen as our contribution for the big day. Soon the place became very busy and all hands seemed to be involved in preparing our big Christmas dinner. There would be turkey and ham with all the trimmings, followed by my favorite dessert, pecan pie! And there were so many cookies, candies and side dishes I won’t try to list them all! The kitchen crew at work. Laura, one of the busiest kitchen hands, was somehow not in this photo. Dinner was followed by gift opening, and my goodness, it was all just too much! So many gifts were passed around and opened that it just made my head spin. I’ve been trying to get the family to cut the gift giving down to just drawing names, but my voice is lost in the din and the rustling wrapping paper. I take no part in it, but still I get a few gifts in spite of asking everyone to please stop. It all seems such a waste to this old Christmas Grinch! A small portion of the gift opening ceremony. Bah! Humbug! I just wish we could celebrate Christmas like we do Thanksgiving. After the gifting finally ended, Lavonne and others began to prepare for the Bingo playing, and I was ready for some peace and quiet. I bid everyone goodnight and headed to the coach for the night. I like my solitude, and it was a wonderful change of pace to be alone in the coach. I began this travelogue, but tired soon after, and dug out the movie Intolerable Cruelty and began watching it for probably the 20th time. It is one of my all time favorite comedies, and I laughed along with it as though it were my first viewing! Sometime during the movie, Lavonne returned from the goings on at the Christmas bash. She was plumb worn out, too, from all the activity and headed to bed soon after. I enjoyed a couple cool ones as I resumed watching the movie, but by 2300 I headed to bed, too. It was a long, enjoyable and Merry Christmas with family. Day 2, Wednesday, December 26, 2018: “The Twins” Turn 75 Years Old! The Twins’ grand entrance was a long, long time ago, 75 years ago this very day to be precise, as WWII raged around the world. Our mom, Rae Gillespie, awoke in San Francisco’s St. Joseph’s hospital, probably a bit disappointed that she didn’t deliver her baby on Christmas day, as she had hoped. Surely, everyone knew, the baby would arrive soon. And it would be about noon that winter Sunday in a WWII fortress known as San Francisco that little Gale Lavern Gillespie came into this world. But wait! There was more to come! And even littler Dale followed 15 minutes later, completely unexpected, to become one of The Twins, as we would be referred to for years after. I was a scrawny, tiny, little guy of less than five pounds – mom used to tell folks that I looked like a baby sparrow that had fallen from the nest. And when the time came for baby Gale to go home with mommy and daddy a few days later, tiny Dale was left behind in an incubator to grow enough to survive at home. And that was when I learned that Mom liked Gale best! Gale and I must have been on sale, judging by the hospital bills from that long ago time. The above bills seem to indicate that Mom and Gale went home on January 1, eight days after Mom checked in on December 24th. It appears that I was kept in an incubator ’til about January 7th. My memory of those days long ago is a bit fuzzy, so I can’t be sure. It also shows that Mom and/or I were given glucose, a transfusion, and more tests and medications. It seems I was pretty troublesome even way back then! The Twins! We were quite the stars in our family waaay back then as we were the one and only set of twins in the family. I am the bald one. 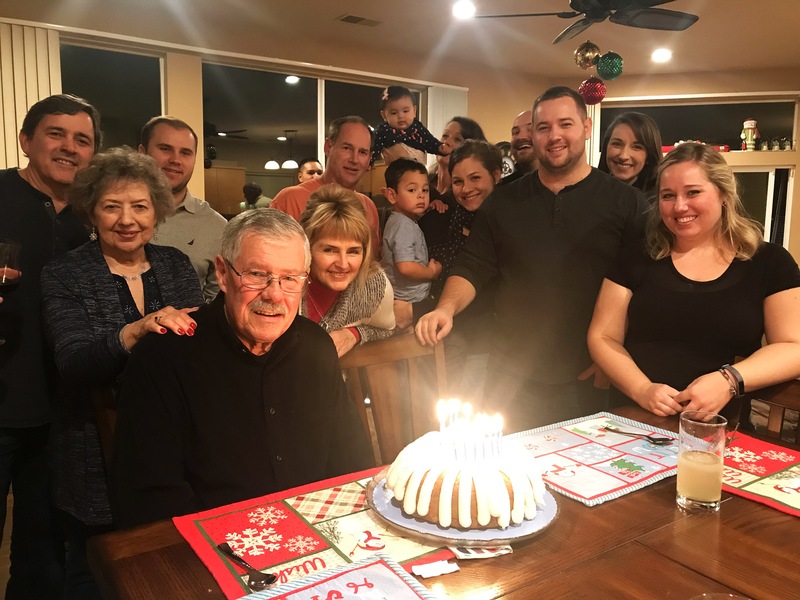 And this 26th day of December we celebrate our 75th birthday separately, but on Sunday we would be together in Gridley with family to celebrate together, including our children and grandchildren – and Gale’s great grandson! A lot has happened in those 75 years! Meanwhile… we were up and about by 0700 and worked through the morning chores and enjoyed some coffee and ‘puter time in the coach. It was a cool morning and the heater ran regularly to keep us comfy. Craig came to the coach for a quick “good morning” and we sat visiting for some time. But come breakfast, we headed up to his kitchen where he began frying some taters for breakfast. I fried up some eggs and delicious Honey Baked ham, and soon we were enjoying a good breakfast. This day would see Allen and Nancy, who live near Denver, arrive at the Sacramento airport from Los Angeles where they had spent time with family at Christmas. We would head to the Sacramento airport aboard the coach around noon, and we did our own things ’til that time. But the laid back day would soon become one frustrating traffic jam after another as we made our way to the airport on I-5. We followed the advice of Google Maps as we headed north, and twice turned off the freeway to avoid slow, bumper to bumper traffic. One of our detours saved us time; the other cost us even more time. But after the frustration of entirely too much traffic we made our way into the ridiculously busy airport. During one of our detours suggested by Google Maps, we found ourselves in this mess. It was bumper to bumper to a stop sign that was the intersection from hell! Eventually we made it to the airport, but managed to get lost on the airport’s roads once we arrived! It was the day after Christmas, sure enough, and we were joining thousands of others as they traveled by air and car back home from Christmas holidays. Finally, in a round about way, we picked up Allen and Nancy. Our surprise with the “party bus” ride home seemed to please them a great deal! And it was, for sure, a party all the way home as Craig plugged in Lavonne’s Margaritaville machine that whips up wonderfully slushy margaritas. Of course the driver had to settle for diet soda. The drive home was a real party and we had a grand time – and the traffic was much, much improved! Craig operates the Margaritaville mixer as Allen lends a hand. That machine makes incredible margaritas! Craig, Nancy and Allen partied all the way home. We missed Lavonne in this photo, but she partied, too! The poor, underprivileged driver with his lowly diet soda as Allen (and everyone else) enjoys icy Margaritas! Photo credits: Allen, Nancy, Craig. I enjoyed a margarita (or three) when we arrived back home, and along with my frazzled mental state after the crazy airport run, I headed to the coach for my grandpa nap. As I took my grandpa nap, Lavonne put together a long list of Chinese food for my birthday party. She ordered it from my favorite restaurant, Dave Wong’s, which is just a few blocks from Craig’s home. Brett and Nancy helped with the order, and when it was time to pick it up, Brett did us all the favor of driving to and from the restaurant. After my nap of about an hour, I headed back upstairs to Craig’s where folks had already been arriving and my party was warming up. Little Jeremy greeted me as I made my grand entrance to the party and wanted Uncle Dale to pose with his party hat. And that’s the only reason this photo made the cut! Ashley and Darren’s lil’ cutie, Jeremy, posed with Uncle Dale. Eventually there were 17 family members altogether, and they all wished me a very happy birthday – both in song and in the wonderful way they celebrated my 75th birthday! I was very pleased, and was reminded of the loving and giving family I had the great pleasure of marrying into when my dear Lavonne and I tied the knot nearly 29 years ago! I am a very lucky, old man! Brett partakes of the delicious Dave Wong’s Chinese buffet which was, of course, my choice for the big event. And along with this photo, I hereby bequeath to Brett my long held title of the family’s Healthiest Appetite after all these years – and he has some big shoes to fill! After I had eaten my fill, and I didn’t even finish all the delicious Chinese food on my plate, it was cake time! Lavonne carried out the big white chocolate raspberry bundt cake with two groups of candles glowing brightly. One group of seven and another group of five candles represented my 75 years. The party-goers belted out the familiar Happy Birthday song for this old man, and I blew out the candles. Raspberry bundt cake is about my favorite and I sure enjoyed it! As is my habit – and the family would expect nothing less – not long after dinner, the singing, the cake presentation, and my present opening time, I was the first to exit the party. I thanked everyone for their kindness and good wishes, then headed to the coach for the night. It had been a long day that was quite tiring for this ol’ grandpa. It was good to be alone in the coach once again. I looked over the many photos that had been taken during the “party bus” ride and the birthday party, but was too tired to do any photo editing. By 2300, Lavonne had returned to the coach and we both retired for the night. And now… we’re both 75 years old, and will be ’til Valentine’s Day which will be Lavonne’s 76th birthday! It had been a very “Happy 75th Birthday” to remember for a long time, and here’s a heartfelt Thank You to Lavonne and Craig and the whole wonderful family for their loving celebration of my old age. I rolled out of our very comfortable bed about 0600 and turned up the heaters and the water heater, then began my morning chores. Lavonne joined me a while later. The day was yet to be planned and we had no pressure on us to do anything or go anywhere – except upstairs to visit with Craig, Allen and Nancy. We didn’t hear from them ’til about 0900. It was decided we’d head up to Craig’s kitchen for coffee with them, and then our thoughts turned to breakfast. We each hunted and gathered on our own. I dug out leftovers from the Chinese feast and enjoyed Chinese food for breakfast – it was quite good but that’s just me. No one else seemed to share my taste in breakfast choices and ham and eggs seemed to be the choice for most. After breakfast and a nice family visit, I headed back to the coach and for the next several hours edited photos and wrote this travelogue. There were a lot of photos to choose from and relatively few made the cut. The recently celebrated 75 year old geezer is shown here blogging away the morning and some of the afternoon. Keeping this site updated and somewhat interesting is something I really enjoy, and it has become a pretty fair historical record of our family. Sometime around noon, Allen joined me in the coach to take my order for an In-N-Out Burger lunch they were planning. Really?! I had told myself the day before that since it was my birthday, I should indulge in that very thing, but had neither the time nor the inclination during that wild airport run. I gave Allen my order for a cheeseburger, a vanilla shake and an order of fries. Not long afterward, Brett appeared with a bagful of In-N-Out and we all gathered ’round the table for a great lunch of burgers ‘n fries. It was a very welcome lunch as I rarely allow myself such a treat – but if not over this holiday time, when?! It was decided by everyone else to go shopping that sunny, windy afternoon, and so they did. While they were gone, I took my grandpa nap and enjoyed the quiet solitude of our very comfy Big Blue. The shoppers returned around 1700 with their booty from various stores, including the makings for turkey enchiladas which would be dinner. After the folks were home a while, I headed up to the kitchen and joined in as dinner was taking shape. 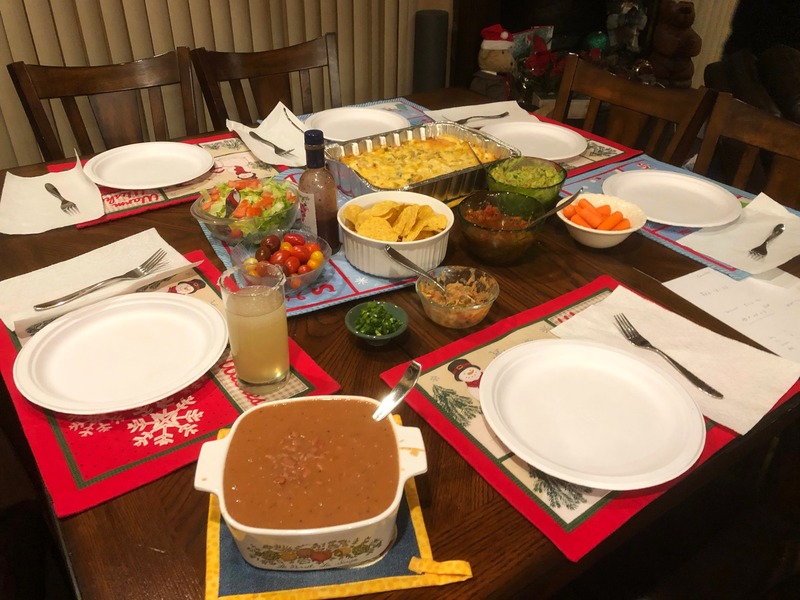 Nancy took the lead for the night’s feast as she whipped up the wonderful batch of turkey enchiladas. After dinner we played the game of Sequence around the table, and I joined in for an hour or so to please the family since they needed a sixth player to make three teams. I’m not much for table games, and that hour reminded me of that fact. At about 2030 hours I headed to the coach after bidding the family good night and thanking them all for the wonderful visit we have so enjoyed. Lavonne joined me in the coach about a half hour later. We whiled away the evening with chores, showers and such and then spent time online, as usual, visiting our favored websites. Lavonne called it a day around 2200 and I joined her an hour later. It had been a wonderful day with a wonderful family and that makes us know that life is good! Day 4, Friday, December 28, at ease at Craig’s Castle for another day. I was up a bit after 0600 and turned up the heaters, then went back to bed as the heaters did their thing. I began my day a short time later, and Lavonne joined me soon after. Daybreak on Craig’s street in Stockton. Cool and beautiful. We spent our morning as usual ’til after 0900 when we called Craig to see if they were up and about – of course they were! We joined Craig, Allen, Nancy and Brett for breakfast as Craig was preparing his famous buttery waffles and bacon – and most had fried eggs, too. I opted for a Chinese food breakfast again, and had the last of the honey walnut prawns, egg foo young and a couple other wonderful dishes from Dave Wong’s. And the Chinese food was just about gone after my second breakfast of the stuff. As I enjoyed breakfast and Craig was cooking waffles, etc., he suggested we drive to Murphys aboard the coach, and I agreed. It sounded like a fun day for the family aboard the party bus! So I headed right down to the coach after my breakfast and began preparing the coach for the day’s drive. When I came back up to the kitchen later, they had decided they would rather drive to Mt. Diablo. Now, that was a whole ‘nother matter. East toward Murphys would be enjoyable, but to head to the Bay Area and fight traffic all day was not sounding so good. I passed on the idea so Craig, Allen and Nancy headed out in Craig’s fine Audi S6 sedan to Mt. Diablo. I was almost relieved that they chose to drive there and Lavonne and I would just rest around the house and coach while they went sight seeing. That sounded just fine! I did a few chores around the coach that needed tending to as there’s always something to be done around these wonderful inventions. I took my grandpa nap. I perused the web. I wrote the day’s travelogue – even though we were not traveling that day. While the kids were gone to Mt. Diablo we just hung around the place and enjoyed the nothing that we had to do. For lunch I enjoyed birthday cake and apple pie from the party two days ago – and it was delicious! When Craig, Allen and Nancy returned from their day’s adventure, they joined us in the coach where we had a nice visit before they, including Lavonne, headed to Breanne’s home in Tracy for dinner. I had an evening at home alone, which was just what I enjoy. The kids returned after dark, not from Mt. Diablo, but Discovery Bay, where they finally wound up after changing their minds again. The plan was, and had been for some time, to drive to Breanne’s home in Tracy that evening for dinner, and they took Lavonne along. I declined once again, as I just don’t want to be driven somewhere and not have my own ride home when I am ready. They left around 1830 hours or so, and would be gone the entire evening. I enjoyed Chinese soup for dinner, but two quarts of what I thought was egg drop soup was something else – and was very tasty anyway. There were two quarts of the stuff – untouched at the party – and I had one quart for dinner. After researching the ingredients of what the soup was, it turned out to be egg blossom soup – and I was a bit disappointed to see that what I thought might be chicken feet was just ginger. Shucks. I thought I had some bragging rights about liking chicken feet! And I was beginning to get my fill of Chinese. I kept the other quart of soup, but the rest of the Chinese leftovers finally were tossed out. I spent the evening updating this blog, and also watched more of the DVD collection World at War, which is a very interesting history of WWII. Lavonne arrived home a bit before 2300 hours with Craig, and they’d had a lovely time at Breanne’s party. Allen and Nancy spent the night at Breanne’s home. I had a lovely time at home! Lavonne and I retired shortly after she arrived and slept well in the very cozy Big Blue although the overnight temp dropped into low 30s. We were up and around sometime around 0600 to face a very cool morning, but the heaters kept us comfy. After the usual morning routines, Lavonne and Craig headed to the local Krispy Creme shop and came home with a few delicious donuts. That was breakfast and not a bad change of pace, but it could easily become a bad habit. When Allen and Nancy returned from Breanne’s, we visited with them and Craig in the coach for awhile. Sometime after 1100 Lavonne and I thanked them all for another wonderful Christmas and birthday time together, then pulled out of Craig’s driveway for the rest of our birthday celebration week. We headed north toward Gridley. The next day would be the 75th birthday party for Gale and I which we billed as our 150th! En route we stopped at the Love’s Plaza to dump our holding tanks, and would drive to Oroville for a “cheap” diesel fill-up. The Sacramento water tower I seem to always shoot showed a light southerly breeze which was pleasantly unusual – it’s usually blowing from the north. It was a perfect winter travel day. I presumed the half staff was for President Bush 41. The waterfowl love the flooded rice paddies this time of year. This is but a fraction of the thousands and thousands we saw. We continued north – beyond Gridley to Oroville and the Feather Falls Casino’s gas station where they sold diesel for just $3.10. I pumped on 54 gallons to fill up. What a place to buy fuel! Not only was their price about 70¢ below most stations, but the pump allowed me to keep pumping the full amount of almost $168! Most would stop me at $75 or $100. I wish we lived closer! The Feather Falls Casino’s gas station where diesel is so “cheap”. We had almost a half tank at the time, but still pumped on 54 gallons of the “cheap” stuff! I love “cheap” diesel! (But my joy is tempered by the memory of 25¢ diesel back in my truckin’ days.) The gal at the desk told me they buy diesel from Nevada and thereby avoid Kalifornistan’s higher taxes, including a storage tax that is hidden in the usual supplies of local fuels. We drove to Gridley and set up the coach in the driveway at Gale and John’s home. Gale and John and their clan went to lunch together in Yuba City, and after we arrived and were settled, they arrived back at Gale and John’s place through late afternoon, one sub-clan at a time. Big Blue at rest at Gale and John’s country home near Gridley, CA. She would soon be kept company by six or eight cars as sub clans visiting from as far as Oregon and Arizona gathered to party and watch football on Saturday night. Lavonne and I watched from the coach as each group walked to the house and for some of them we had no name to place with the face. There were Gale and John’s children, Jill and Kevin, and their spouses. Between them there were their three children and significant others, and their children and their significant others. And even Gale and John’s great-grand son, Cedric. There was my son Dean, his wife and two sons. The fact is, we seldom if ever all get together, so it’s no wonder we had trouble with names and faces! When Dean, Melissa and the boys, Connor and Aidan, arrived, we joined them in the driveway and shared hugs all ’round. I hadn’t seen Melissa, Connor or Aidan since a year ago last August, darn near a year and a half! I saw Dean once in that time when he came up alone to visit, and we – Lavonne, Dean and I – drove to Gale and John’s in the coach for a couple of days. I told them this had best be the last time they take so long to see us! I drove down every three months for 15 years or so to see them in Oceanside, and told them back in August, 2017 that my traveling through LALA land to see them would be no more – at my age it would be up to them to see me. And during this visit, I was promised another visit this summer! When we finally joined the gang in the house, it was simply one of those parties that I always avoid. I nibbled on a few of the snack food offerings, said many hellos, and visited with my sis awhile, showing her the portion of this travelogue about the day of our birth (above) and she seemed to enjoy it. But very soon I’d had it with the noise and the chaos, and Lavonne and I said our good-byes, then headed back to the coach for the night. I especially loved Big Blue that evening! Lavonne and I spent the evening as usual, doing evening chores, surfing the web and enjoying the quiet evening. Dean, Melissa, Connor and Aidan dropped in at the coach for a few minutes as they were leaving the party to return to their motel rooms, and we had a nice visit in the quietness of the coach. Life is good aboard Big Blue! Day 6, Sunday, December 30, 2018, Our 75th Birthday Bash! We awoke that cold, December morning in the countryside near Gridley and discovered the driveway nearly empty. Only Jill and Craig spent the night at Gale and John’s, as everyone else had motel rooms in town for their visits. After morning chores around the coach, we headed to the house and visited with them a short while. They would all be going to the morning church service at Gale and John’s church, the same place our party would be held in the afternoon. We enjoyed a “hunt and gather for yerself” breakfast with them, then returned to the coach as they prepared for church. After church when they had returned, we visited a bit, then prepared to head to the party. The church was just on the other side of Gridley, only a three mile drive. We drove over in the coach as I’m happiest when I have my own ride home. And I had a refuge should things get too loud at the party! The many cars in the parking lot along with Big Blue announced that something pretty special was taking place! The party was to start at about 1400 hours, and I was pleasantly surprised at the number of people there – John said he counted 47 noses during the party, and I’m sure that Gale and I never before had such a well attended birthday party! 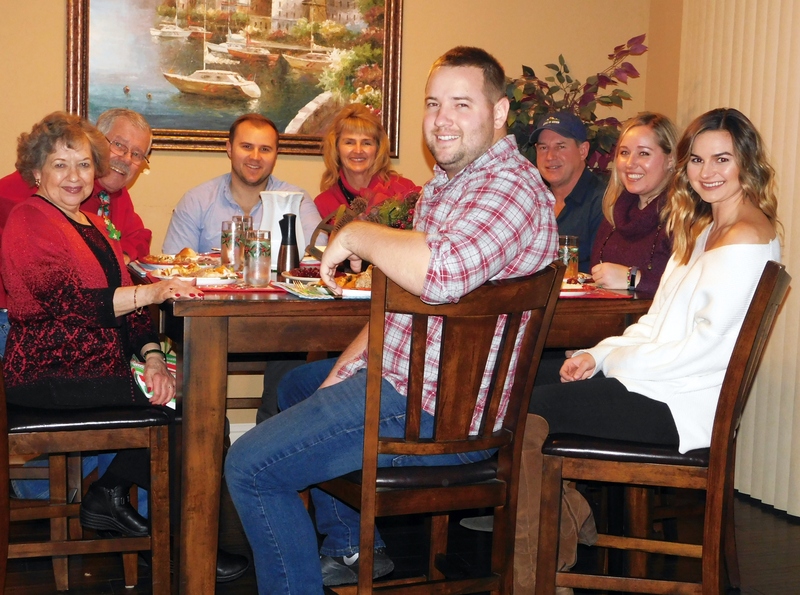 I was told that the Craig and Allen clans would not be at this party, and having thrown me the lovely party on Tuesday (above), I certainly didn’t expect them to make the hundred mile drive to Gridley. But as the party got underway, there was Craig, Laura, Allen, Nancy, Breanne and Brett, all present with smiling faces and enjoying every minute of the party! I was very, very surprised to see them and that was a fun moment for all of us. Dean, Melissa, Connor and Aidan, when together with Craig and Allen’s clans, really are just one big family. And that big family loves Lavonne and I and loves to party – what lucky people we all are! Also at the party, and for whom I don’t yet have a photo, were my dear cousin, Murle Jean, her daughter Jody, and husband Steve. They made the nearly 250 mile round trip that day to celebrate our 75th birthday. I was very happy to have them join us. And here are… The Twins! Now 75 years old! December 26, 1943 was a long, long time ago but, even though I say so myself, we look pretty spry and happy. And I never realized that folks so old could be so good looking! The folks at John and Gale’s church, Christian Life Church, hold a free dinner once each month for the homeless and, for that matter, anyone who wishes to partake. The cook and the manager of that effort are also available for events such as ours. Lavonne managed the business end of organizing the details for the delicious meal that was served. Gale and I chose fried chicken, mashed potatoes, country gravy, cole slaw, green bean casserole and Hawaiian rolls as our meal. It was served buffet style and everyone had their fill. We also brought home a lot of that food! It was a well prepared and served meal and we were very pleased with the very professional service that the good folks of the Christian Life Church provided. A portion of the large party as we visited one another. Jill and Kevin pay tribute to Gale their Mom and Uncle Dale. Kevin as M. C. as slides played on the screen. The photo shown is of Dean and I aboard my fishing boat. Another view of the party. Gale and John’s son, Kevin, acted as M.C. for the party, and in his brief talk he encouraged others to share stories about Gale and I. Dean presented a very nice photo montage of Gale and I through the years that he and Melissa assembled for the party, and I commented on a few of the photos. There! I feel much better now… thanks! And… thanks, Son, and Melissa, for the wonderful gift of that slide show and all the work that went into making it. Gale and I surely enjoyed it and I’m sure many others did, too. It’s not your fault that I have such a tender ego! The photo birthday cake of… The Twins! Dale and Gale and the cake. …just a good photo of some of the gathered clans. Dale at the podium getting ready for a breakdown. And that skinny little kid on the screen?! I’m told that’s me almost 70 years ago. Dean at the podium with his slide show. On the screen are The Twins! Connor, Aidan, Melissa, and Dean. – The Gillespies. As the big birthday party came to an end, we all gathered outside for a special photo of (hopefully) everyone who attended. It was a handsome group of good people! I left the party a bit earlier than some as I wanted to drive the motorhome back to Gale and John’s before dark so that I could see to back into the driveway for our last night of our week long Christmas and birthday adventure. Back at Gale’s, quite a few family members had gathered again. Another gathering took place in town with most of Craig’s, Allen’s and Dean’s families, including Lavonne. I’m not much for restaurants, and chose to stay in the coach. It appears that Connor and Aidan stayed at their motel room, too. Dean (L-R), Craig, Lavonne, Nancy, Breanne, Laura, Melissa, Brett and Allen met at the Rail House Pub and Grill in Gridley. Craig’s and Allen’s families had to rent motel rooms in Yuba City. It seems our party was good for the local economy as no more rooms were available in Gridley. Afterwards, Dean and Melissa brought Lavonne home and visited a while before returning to their motel. Lavonne and I were pretty much whipped, and I’m sure Gale and John were, too. What a wonderful day it had been! It had been a week of celebrations! Lavonne and I are so blessed with the wonderful families we call our own. And with the ability to have our own apartment at Craig’s and at Gale and John’s with Big Blue parked in the driveway, our visits are more convenient for everyone. Our week long adventure with family and friends had come to a close, and we were ready to be back home. We have a sign on the fridge at home that reads No matter how far you may roam, the best part is coming home. And it is. We visited with Gale, John, Craig and Jill for a time that morning, but shortly after 1000 hours, we bid our good-byes, shared our hugs all ’round, and pulled out of their driveway. More waterfowl to watch as we drove home through the flooded rice paddies. Goodness! I may have enough chicken, taters & gravy, and cole slaw to last a day or two! The gate opened wide for us as we arrived back home after a truly wonderful week of family time. The Sutter Buttes up close and personal. This is the smallest mountain range on the planet! The drive home was unremarkable, as we like. We even had a brisk north wind pushing us along that made for a quieter ride and saved fuel. We like that combination when we can get it. We arrived home around 1230 hours, and set about unloading all the stuff we loaded on when we left. We also turned the house back on, including heater, water heater, etc. And we brought home so much chicken and all the fixings from the birthday dinner that I might actually get tired of eating fried chicken! My next adventure aboard Big Blue would be my annual Search for Sunshine during January, a trip into Texas or, perhaps for a change, a drive along the Gulf Coast through the southern states. It will all depend on the weather; where the sun shines warmest is where I’ll head! This entry was posted in Travel: Craig's Castle, Travel: Gale & John. Bookmark the permalink. 5 Responses to Christmas 2018 and The Twins Turn 75! I’m glad we were able to be there to help celebrate your birthday in a way that was meaningful to you, Dale. You and your sister are very sweet together and to each other. You truly are blessed. note above was from Nancy! :). Hi Nancy – Yes! I truly am blessed and maybe didn’t realize how blessed ’til this past week. This whole family is blessed and I am happy to be a part of it. Thanks for the visit . I found your blog a few years back after doing a google search of ”Delta Fishing”. Since then I, and my Mother, have very much enjoyed all of your travelogues and fishing stories. She passed in June 2018, and I just thought I’d leave this message, informing you of the light you brought her (and my) heart. That was about the kindest comment I’ve ever received here, and I’m so pleased to know that you and your mother enjoyed the stories. You made my day! Sorry to hear of your mother’s passing. Thank you for your kind comment and your visits.